What a wondrous and challenging feast we celebrate at Pentecost! A feast like this challenges us because it puts to the lie a lazy, sleepy, hidden, and tepid Christian life. The Lord Jesus said to apostles, and still says to us, I have come to cast a fire on the earth (Luke 12:49). This is a feast about fire, a transformative, refining, purifying fire that the Lord wants to kindle in us and in this world. It is about a necessary fire, for as the Lord first judged the world by fire, the present heavens and the earth are reserved for fire. Because it is going to be the fire next time, we need the tongues of Pentecost fire to fall on us in order to set us on fire and bring us up to the temperature of glory. The readings today speak to us of the Holy Spirit in three ways: the portraits of the Spirit, the proclamation of the Spirit, and the propagation by the Spirit. I. The Portraits of the Spirit – The reading today speaks of the Holy Spirit using two images: rushing wind and tongues of fire. These two images recall Psalm 50, which says, Our God comes, he does not keep silence, before him is a devouring fire, round about him a mighty tempest. Genesis 1:2 speaks of this, saying, the Spirit of God was moving over the face of the waters. Genesis 2:7 speaks even more remarkably of something God did only for man (not for the animals): then the LORD God formed man of dust from the ground and breathed into his nostrils the breath of life; and man became a living soul. So, the very Spirit of God was breathed into Adam! As we know, though, Adam lost this gift and died spiritually when he sinned. Thus, we see in this passage from Acts an amazing and wonderful resuscitation of the human person, as these first Christians experience the rushing wind of God’s Spirit breathing spiritual life back into them. God does C.P.R. and brings humanity, dead in sin, back to life! The Holy Spirit comes to dwell in us once again as in a temple (cf 1 Cor 3:16). It has been said that Christmas is the feast of God with us, Good Friday is the Feast of God for us, but Pentecost is the Feast of God in us. Tongues of Fire – The text from Acts then says, Then there appeared to them tongues as of fire, which parted and came to rest on each one of them. The LORD reigns; let the earth rejoice; let the many coastlands be glad! Clouds and thick darkness are round about him; righteousness and justice are the foundation of his throne. Fire goes before him and burns up his adversaries round about. His lightnings lighten the world; the earth sees and trembles. The mountains melt like wax before the LORD, before the Lord of all the earth. The heavens proclaim his righteousness; and all the peoples behold his glory. Scriptures also call God a Holy fire, a consuming fire (cf Heb 12:29) and a refining fire (cf Is. 48:10; Jer 9:7; Zec 13:9; Mal 3:3). So it is that our God, who is a Holy Fire, comes to dwell in us through His Holy Spirit. As a Holy Fire, He refines us by burning away our sins and purifying us. As Job once said, But he knows the way that I take; when he has tested me, I will come forth as gold (Job 23:10). God is also preparing us for judgment, for if He is a Holy Fire, then who may endure the day of His coming or of going to Him? What can endure the presence of Fire Himself? Only that which is already fire. Thus, we must be set afire by God’s love. Behold how the Holy Spirit moves them to proclaim, not just within the safety of the upper room, but also in holy boldness before the crowds that have gathered. Notice the transformation! Moments ago, these were frightened men who gathered in secrecy behind locked doors, huddled together in fear. Now, they go forth to the crowds and proclaim Christ boldly. They have gone from fear to faith, from cowardice to courage, from terror to testimony! Well, the Holy Spirit wants to change that. The more we have really met Jesus Christ and experienced His Holy Spirit, the less able we are to keep silent. An old gospel song says, “I thought I wasn’t gonna testify, but I couldn’t keep it to myself, what the Lord has done for me.” The Holy Spirit, if authentically received, gives us zeal and joy, burning away our fear so that testifying and witnessing come naturally. Note also how the Spirit “translates” for the apostles. The people in the crowd before them spoke different languages, yet each heard Peter and the others in his own language. The Spirit, therefore, assists not only us but also those who hear us. My testimony is not dependent on my eloquence alone but also on the grace of the Holy Spirit, who casts out deafness and opens hearts. Every Christian should remember this. Some of our most doubt-filled encounters with others can still bear great fruit because of the work of the Holy Spirit, who “translates” for us and overcomes many obstacles we might think insurmountable. III. The Propagation by the Spirit – In the great commission, the Lord said, Go, therefore, and make disciples of all nations, baptizing them in the name of the Father, and of the Son, and of the Holy Spirit, teaching them to observe all that I have commanded you. And behold, I am with you always, until the end of the age (Matt 28:19ff). He also said, I have come to cast a fire on the earth and How I wish the blaze were already ignited (Luke 12:49). How is the Lord going to do this? The walls of my parish Church answer the question. The clerestory walls are painted Spanish red, and upon this great canvas are also painted the stories of the lives of twenty saints, surrounding us like a great cloud of witnesses (cf Heb 12:1). (See also the video below.) Over the head of every saint is a tongue of fire. This is how the Spirit of the Lord fills the earth. It is not via “magic fairy dust.” It is in the fiery transformation of every Christian going forth to bring warmth and light to a cold, dark world. This is how the Lord casts fire upon the earth. This is how the Spirit of the Lord fills the orb of the earth—in the lives of saints (and in your life)! In the end, the great commission (Matt 28) is our first and most important job. No matter what else we do, we are supposed to do this. Parishes do not deserve to exist if they do not do this. As individual Christians, we are a disgrace and not worthy of the name if we fail to win souls for Jesus Christ. The Spirit of the Lord is going to fill the orb of the earth, but only through us. The spread of the Gospel has been placed in your hands. It’s scary, isn’t it! Happy feast of Pentecost! Don’t forget that the basic image is very challenging, for it means getting out of the “upper room,” opening the doors, and proclaiming Christ to the world. Let the Holy Spirit light a fire in you. Then you can’t help but spread light and heat to a dark, cold world. The video below features details from the clerestory of my parish, Holy Comforter in Washington, D.C. Notice the tongue of fire above each saint. The paintings show how the Spirit of the Lord fills the orb of the earth through the lives of the lives of the saints (and through you, too). It is not magic; it is grace, working in your life, through your gifts and your relationships, so that the Lord will reach each soul. The witnesses on the walls of my Church say, “You are the way that He will fill the earth and set it on fire.” Let the blaze be ignited in you! et replevit totam domum, alleluia. they were all with one accord in one place, saying, alleluia. And suddenly there came a sound from heaven, alleluia. What a wondrous and challenging feast we celebrate at Pentecost! A feast like this challenges us because it puts to the lie a lazy, sleepy, hidden, and tepid Christian life. The Lord Jesus said to Apostles, and still says to us, I have come to cast a fire on the earth (Luke 12:49). This is a feast about fire, a transformative, refining, purifying fire that the Lord wants to kindle in us and in this world. It is about a necessary fire. For as the Lord first judged the world by fire, the present heavens and the earth are reserved for fire. Because it is going to be the fire next time, we need the tongues of Pentecost fire to fall on us to set us on fire and bring us up to the temperature of glory. This text brings us to the very root meaning of the word “spirit.” Spirit refers to breath. This is preserved in the word “respiration,” which is the act of breathing. So the Spirit of God is the breath of God, the Ruah Adonai (the Spirit, the breath of God). Genesis 1:2 speaks of this, saying, the Spirit of God was moving over the face of the waters. And Genesis 2:7 speaks even more remarkably of something God did only for man (not the animals): then the LORD God formed man of dust from the ground, and breathed into his nostrils the breath of life; and man became a living soul. Thus we see in this passage from Acts an amazing and wonderful resuscitation of the human person, as these first Christians experience the rushing wind of God’s Spirit breathing spiritual life back into them. God does C.P.R. and brings humanity, dead in sin, back to life! The Holy Spirit comes to dwell in us once again as in a temple (cf 1 Cor 3:16). It has been said that Christmas is the feast of God with us, Good Friday is the Feast of God for us, but Pentecost is the Feast of God in us. God is also preparing us for judgment, for if He is a Holy Fire, then who may endure the day of His coming or of going to Him? What can endure the presence of Fire Himself? Only that which is already fire. Thus we must be set afire by God’s love. So behold how the Holy Spirit moves them to proclaim, not just within the safety of the upper room, but also in holy boldness before the crowds that have gathered. Notice the transformation! Moments ago these were frightened men who gathered in secrecy behind locked doors. They were huddled together in fear. Now, they go forth to the crowds and proclaim Christ boldly. They have gone from fear to faith, from cowardice to courage, from terror to testimony! Well, the Holy Spirit wants to change that. To the degree that we have really met Jesus Christ and experienced His Holy Spirit, we are less able to keep silent. An old gospel song says, “I thought I wasn’t gonna testify, but I couldn’t keep it to myself, what the Lord has done for me.” The Holy Spirit, if authentically received, wants to give us zeal and joy, to burn away our fear so that testifying and witnessing come naturally to us. Note also how the Spirit “translates” for the Apostles. The people in the crowd before them spoke different languages, yet each heard Peter and the others in his own language. The Spirit, therefore, assists not only us but also those who hear us. My testimony is not dependent on my eloquence alone but also on the grace of the Holy Spirit, who casts out deafness and opens hearts. Every Christian should remember this. Some of our most doubt-filled encounters with others can still bear great fruit on account of the work of the Holy Spirit, who “translates” for us and overcomes many obstacles we might think insurmountable. Happy feast of Pentecost! But don’t forget that the basic image is very challenging, for it means getting out of the “upper room,” opening the doors, and proclaiming Christ to the world. Let the Holy Spirit light a fire in you. Then you can’t help but spread light and heat to a dark, cold world. This video features details from the clerestory of my parish, Holy Comforter in Washington, D.C. Notice the tongue of fire above each saint. The paintings show how the Spirit of the Lord fills the orb of the earth through the lives of the lives of the saints (and through you, too). It is not magic; it is grace, working in your life, through your gifts and your relationships, so that the Lord will reach each soul. The witnesses on the walls of my Church say, “You are the way that He will fill the earth and set it on fire.” Let the blaze be ignited in you! Most sequence hymns were written in the Middle ages and were sung just before the Gospel as the clergy processed to the place of Gospel. Sometimes, particularly in larger churches, the Gospel was chanted midway down the nave so that it could be heard, and these sequence hymns helped to fill up the time of that procession. Many important feasts of the Church began to have these sequence hymns composed for them during the period of the 11th through 13th centuries. However, after the Council of Trent, in the Missal of Pius V (published in 1570), there were only four sequence: Victimae paschali laudes sung at Easter, Veni Sancte Spiritus for Pentecost, Lauda Sion Salvatorem sung at Corpus Christi, and the Dies Irae for All Souls and in Masses for the Dead. In the 1700s, Stabat Mater for the feast of Our Lady of Sorrows was added. Much later (in the early 1970s) the Dies Irae was removed from the Requiem Mass of the revised Roman Missal and restored in the Liturgy of the Hours as an Advent hymn, which it originally was. It may, however, still be sung on the Feast of All Souls. Let’s look at the sequence hymn for Pentecost (Veni Sancte Spiritus) in a little more detail. The sung version of this hymn is gorgeous and soaring. It starts subtly and builds through the center with soaring notes; then it sets us down gently at the end. Rule that which is deviant. Come, light of our hearts. Here is the traditional Gregorian Chant of this sequence. Enjoy this little masterpiece! Scriptures also call God a Holy fire, a consuming fire (cf Heb 12:29) and a refining fire (cf Is. 48:10; Jer 9:7; Zec 13:9; & Mal 3:3). So behold how the Holy Spirit moves them to proclaim, not just within the safety of the upper room, but also in holy boldness before the crowds who have gathered. Notice the transformation! Moments ago these were frightened men who gathered in secrecy, only behind locked doors. They were huddled together in fear. But now they go forth to the crowds and boldly proclaim Christ. They have gone from fear to faith, from cowardice to courage, from terror to testimony! What about us? Too many Christians are silent, overcome by fear. Perhaps they fear being called names, or being unpopular. Perhaps they are anxious about being laughed at, or resisted, or of being asked questions they don’t feel capable of answering. Some Christians are able to gather in the “upper room” of the parish and to be active, even to be leaders. But once outside the safe confines of the “upper room” they slip into undercover mode. They become secret agent Christians. Note also how the Spirit “translates” for the apostles. The people in the crowd before them spoke different languages yet each heard Peter and the others speak in his own language. The Spirit, therefore, assists not only us but also those who hear us. My testimony is not dependent on my eloquence alone but also on the grace of the Holy Spirit, who casts out deafness and opens hearts. Every Christian should remember this. Some of our most doubtful encounters with others can still bear great fruit on account of the work of the Holy Spirit, who “translates” for us and overcomes many obstacles we might think insurmountable. The walls of my parish Church answer the question. The clerestory walls are painted Spanish red, and upon this great canvas are also painted the stories of the lives of twenty saints, surrounding us like a great cloud of witnesses (cf Heb 12:1). (See also the video below.) And over the head of every saint is a tongue of fire. This is how the Spirit of the Lord fills the earth. It is not via “magic fairy dust.” It is in the fiery transformation of every Christian going forth to bring warmth and light to a cold, dark world. This is how the Lord casts fire on the earth. This is how the Spirit of the Lord fills the orb of the earth—in the lives of saints (and in your life)! What a wondrous and challenging feast we celebrate at Pentecost. A feast like this challenges us, because it puts to the lie a lazy, sleepy, hidden, and tepid Christian life. The Lord Jesus had said to Apostles, and still says to us: I have come to cast a fire on the earth! (Luke 12:49). This is a feast about fire, about a transformative, refining, and purifying fire that the Lord wants to kindle in us and in this world. I. The Portraits of the Spirit – The Reading today speaks of the Holy Spirit using two images: rushing wind, and tongues of fire. These two images recall Psalm 50 which says, Our God comes, he does not keep silence, before him is a devouring fire, round about him a mighty tempest. (Psalm 50:3). Notice the transformation! Moments ago these were frightened men who gathered only behind locked doors, in secrecy. They were huddled together in fear. But now they go forth to the crowds and boldly proclaim Christ. They have gone from fear to faith, from cowardice to courage, from terror to testimony! III. The Propagation by the Spirit – In the great commission the Lord said, Go, therefore, and make disciples of all nations, baptizing them in the name of the Father, and of the Son, and of the Holy Spirit, teaching them to observe all that I have commanded you. And behold, I am with you always, until the end of the age (Matt 28:19ff). He also said, as we have noted, I have come to cast a fire on the earth and How I wish the blaze were already ignited (Luke 12:49). Last year, my own parish, after a year of training, stepped out into our neighborhood, and went door to door and into the local park. And we announced Jesus Christ, and invited people to discover him in our parish, and in the sacraments. As we prepare to celebrate Pentecost Sunday we ought to consider how the Church is strengthened and empowered for her great mission to go unto all the nations. The principal account of it took place in the first reading from the Acts of the Apostles (Acts 2). Go, therefore, and make disciples of all nations, baptizing them in the name of the Father, and of the Son, and of the holy Spirit, teaching them to observe all that I have commanded you (Matt 28:19-20). And so the Church gathered in Jerusalem, about 120 in all, and prayed for nine days (the origin of the Catholic practice of “Novena” wherein one prays nine days for an intention). On the Tenth Day the Holy Spirit came. During those nine days we find the little Church somewhat fearfully gathered. There is no evidence that they are boldly seeking converts. They are a small community huddled together, fearful, behind closed doors, and awaiting a fulfillment of the promise of Jesus to send the Spirit. This was something they probably only vaguely understood. So there’s the image: a community fearfully and apprehensively huddled together, wonder how they would ever Go unto all the nations when they were too afraid even to go out side the doors where the huddled together. This is all about to change, but for a moment, grasp the picture and consider with me if it does not look a lot like many of our Catholic parishes today. Increasingly small communities that huddle together and talk only privately about the Lord but are afraid to go out of the doors of the Church and speak a word about the Lord. Perhaps they will be laughed at, scorned or asked questions they cannot answer. The general approach of most Catholic parishes in terms of evangelization does not seem to be to open the doors and go out but, rather to open the doors and hope people come in. But Christ said “GO.” And still we huddle together fearfully and with an inward focus. We spend most of our time talking about inward things like what color to paint the women’s restroom, who will be the new Holy Name Society President, why women can’t be ordained etc. All perhaps important issues to resolve but the main mission of evangelization is neglected and we focus on inward things too much. Hence we are huddled together, fearful, and lacking in proper focus. Outside the Church doors is a world that needs to hear from us, but still we huddle together, timid and fearful of opening the doors and going out. To be sure it is not wrong to huddle together. It is essential for us to gather each week as a community to ponder the word of the Lord, hear his teaching and plan, be fed and strengthened for our mission. But if all we do is huddle, we are missing the point. Consider a football game. The offensive team always huddles before the play. This is essential to make sure all the team members are on the same page and know their roles. The quarterback makes clear what each is to do. But at a certain point it is time to break the huddle and come out and execute the play. If you went to a foot ball game where all they did was huddle you wouldn’t stay long. The huddle is not the game or the point, is to prepare the play. And then it is time to hustle up and run the play. What would you think of a football player that was afraid to come out of the huddle and run the play? Perhaps he is afraid of getting hit or something. Well it’s clear that we’d think he’s a pretty poor excuse for a football player. But this is our struggle as Christians. Too many of us are afraid to come out of the huddle (the Mass) and run the play. What play you say? 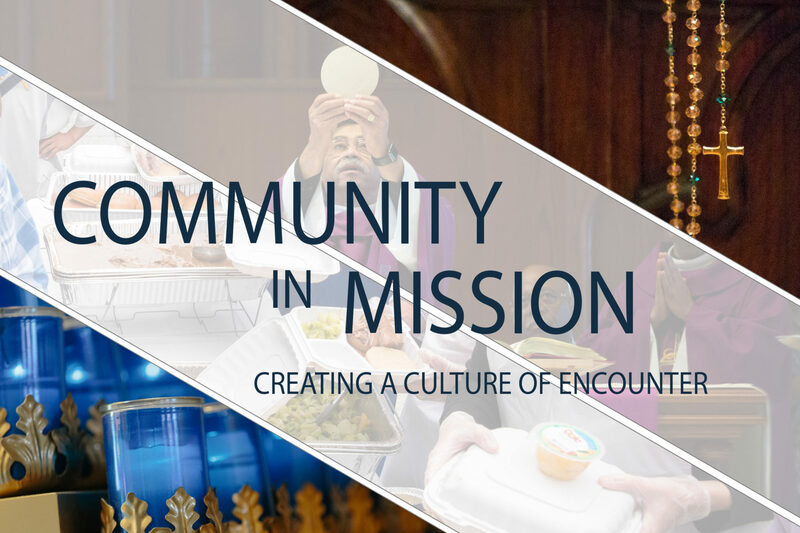 “Go there are make disciples of all nations…..” The deacon or priest says it at every Mass: “The Mass is ended, Go in peace.” And this is short for “Go make disciples….” And so it is that the huddle is supposed to break and we are to go out on the (mission) field. But in too many of our parishes this is not happening. We are not passing on the faith well even to our children, let alone strangers. Come Holy Spirit – The early Church was also huddled together behind closed doors. But on that tenth day (Pentecost) the Holy Spirit descended on them as a strong rushing wind and tongues of fire. And suddenly they started speaking boldly. The next thing we notice is that the door is open and Peter preaches a sermon to the crowd so bold that three thousand are added to their number that day. And the Church went forth that day, unto all the nations. Sure there were fits and starts but the mission to the world had begun. The huddle broke and the play was executed. Surely the Church would huddle frequently, but then they would break huddle and hustle up to the line to execute the play: Go therefore. How about your parish? How about you? Don’t just huddle….., hustle! When the Mass concludes “Go in peace” don’t miss that this is a commissioning. Get out on the field and execute the play. Move the ball, gain some yards! And if you loose some yards, get back up, huddle up again, and hustle again. But don’t give up! First huddle then hustle. Here is an excerpt from the Sermon I preached last Pentecost at my parish here in Washington DC that makes some of these points. We have been conducting a neighborhood outreach this past year. Today we celebrated Pentecost Sunday wherein the Church is strengthened and empowered for her great mission to go unto all the nations. The principal account of it took place in the first reading from the Acts of the Apostles (Acts 2). Here is an excerpt from the Sermon I preached today at my parish here in Washington DC that makes some of these points. I am preparing my parish for a neighborhood outreach.